As a finalist in the 2015 Miss Massachusetts competition, Renee Banks ’19 embodies beauty that is more than skin deep. And after losing her grandfather to melanoma in 2008, she knows that skincare is not something to be overlooked. Banks was a freshman at West Bridgewater High School in Massachusetts when she began to search for a platform for melanoma outreach. She soon discovered the perfect support system in the Miss America Organization. In addition to providing her with the tools she needed to promote melanoma awareness, Miss America would also help Banks hone her public speaking skills and pursue other passions, such as tap dancing. “As a fifth grader, I had the opportunity to meet Miss Massachusetts 2008 and, looking back, I see that she was really my greatest inspiration to start competing,” Banks recalls. She began her Miss America career through the Miss Massachusetts Outstanding Teen program. She competed three times during high school, twice finishing in the top five. The organization encouraged her to continue her work in melanoma awareness. Since then, she has become a full-fledged activist for healthy skin. In 2012, Banks formally entitled her platform “Melanoma Awareness: Educate. Demonstrate. Terminate.” Her early work involved creating a sun safety program for elementary school students. She also fundraised for educational materials and introduced the Melanoma Education Foundation’s “Melanoma Lesson” to her high school. Thanks to her efforts, students at West Bridgewater High School still learn about melanoma in health class. Again, she turned to the Miss America Organization for the tools to make her dreams a reality, this time by winning a scholarship to enroll in the nursing program at Regis. In addition to scholarships, Miss America has provided Banks with meaningful field experiences that complement her coursework at Regis. One of her favorites was a meet-and-greet with patients and families at Baystate Children’s Hospital in Springfield, Massachusetts, and a visit to the neonatal intensive care unit. The hospital is part of the Children’s Miracle Network of Hospitals (CMNH), the national platform of the Miss America Organization. Miss America titleholders like Banks serve as ambassadors to CMNH and raise funds each year for the cause. Banks balances a rigorous courseload with her Miss America Organization activities. (Her favorite course thus far is Anatomy & Physiology II.) She says that a general psychology class has already helped her improve the way that she teaches melanoma awareness classes. Banks was named Miss Blackstone Valley and now holds the title of Miss Plymouth County. Earlier this year, she went on to finish in the top 11 contestants for Miss Massachusetts. 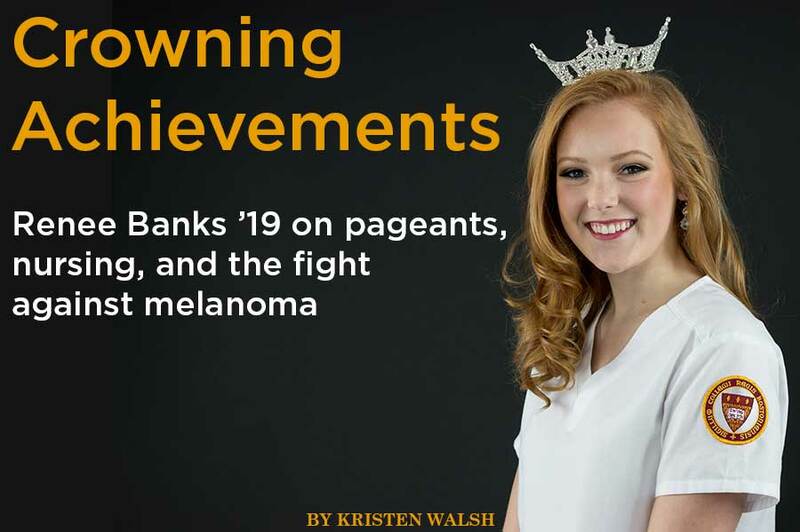 Even though Banks competes in a Miss America pageant only once each year, her melanoma activism is a year-round labor of love. As the student ambassador for the Melanoma Education Foundation, she visits many groups of children around the state and teaches them how to protect their skin. She loves doing hands-on activities and teaching the three “S’s” of effective sun protection: sunscreen, sunglasses, and shade. She also stresses the importance of regular skin examinations. Looking back, Banks credits Miss America for helping her skincare programs gain popularity so quickly. In order to continue to participate in Miss America events, Banks must maintain a high level of academic achievement.